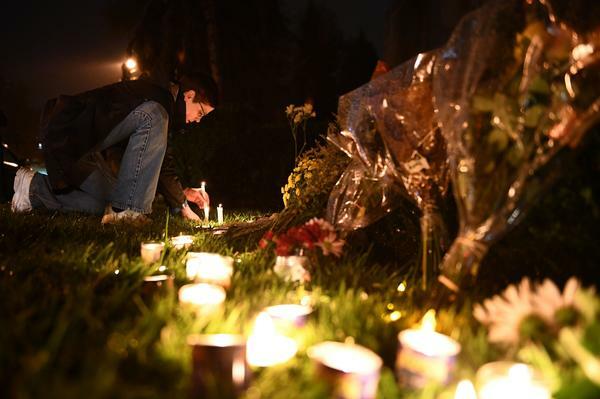 A woman kneels to place a candle outside the Tree of Life Synagogue after a shooting there left 11 people dead in the Squirrel Hill neighborhood of Pittsburgh. 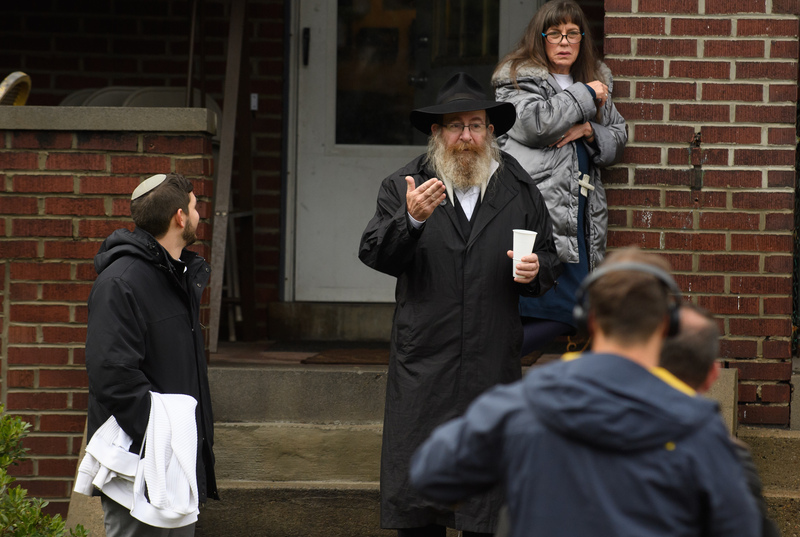 Officials in Pittsburgh reported 11 people, none of them children, were killed in the shooting at the Tree of Life Synagogue in what is being investigated as a hate crime. The federal charges issued to Bowers Saturday night include hate crimes and weapons offenses. Pittsburgh Public Safety Director Wendell Hissrich told reporters six people were injured in the attack. Four police officers were among the injured. 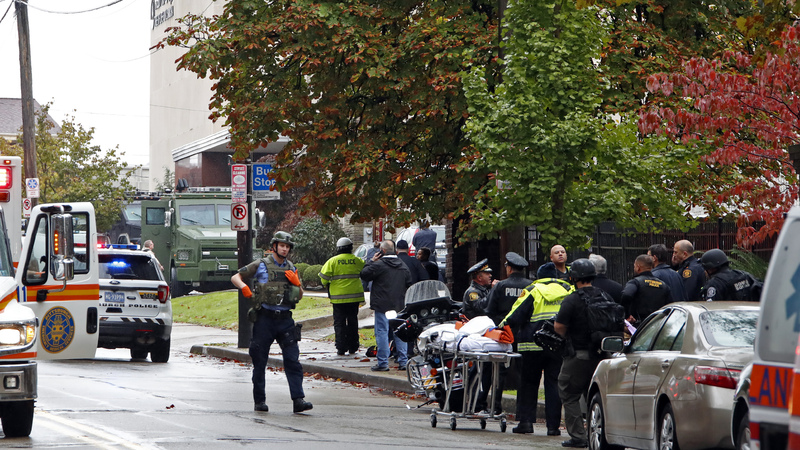 First responders surround the Tree of Life Synagogue in Pittsburgh, where a shooter opened fire Saturday morning. Bowers surrendered to the police inside the synagogue and was taken to the hospital with gunshot wounds but officials say he's in fair condition. His voice breaking, Hissrich said it was a "very horrific crime scene." "It's one of the worst that I've seen and I've been on some plane crashes," Hissrich said. "It's very bad." 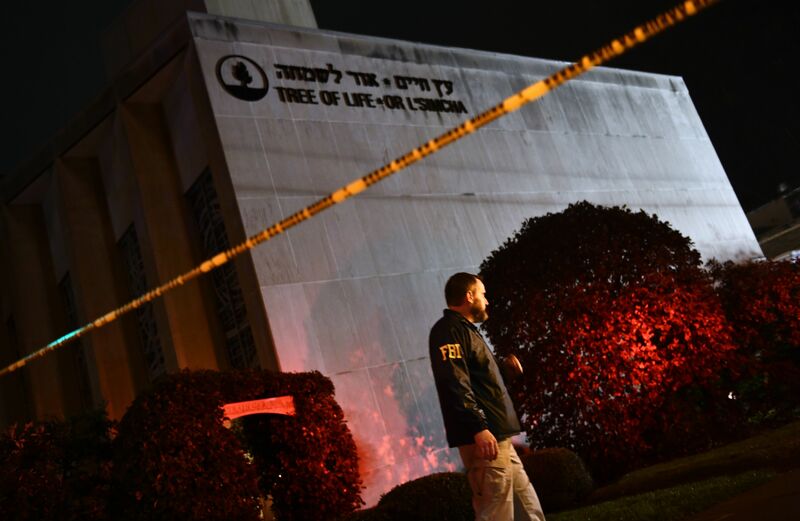 In a statement, the Anti-Defamation League called the shooting one of the deadliest attacks on the Jewish community in the history of the United States. Bob Jones, FBI special agent in charge of the bureau's Pittsburgh office, said that the investigation is still in the early stages, but that agents plan to look at everything in the suspect's life, including his social media activity and movements in the last few days. 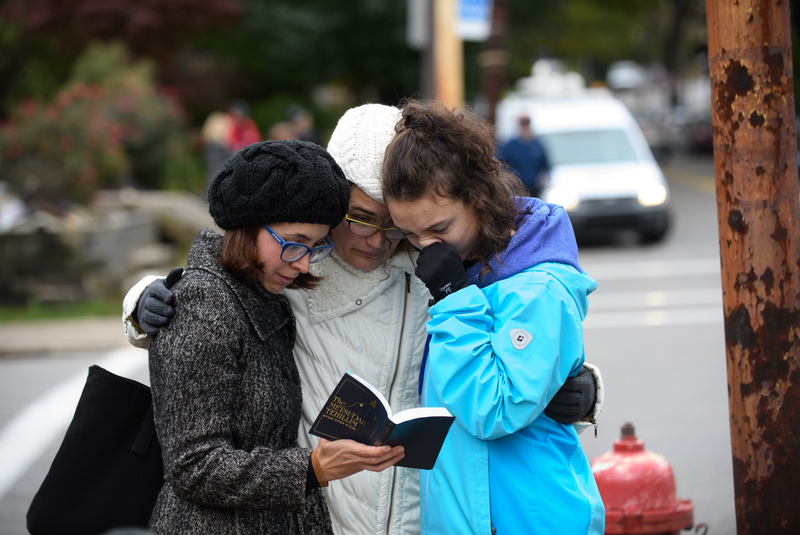 Tammy Hepps, Kate Rothstein and her daughter, Simone Rothstein, 16, pray from a prayerbook a block away from the site of a mass shooting at the Tree of Life Synagogue in the Squirrel Hill neighborhood. Jones said authorities do not believe the suspect was known to law enforcement before the attack. Reports of a shooting began at about 9:54 a.m., just nine minutes after a Saturday service was scheduled to begin at the synagogue. Officers were dispatched to the scene at 9:55 a.m., according to law enforcement officials. Bowers was said to have been in the synagogue for about 20 minutes with an assault-style rifle and three handguns. As Bowers was exiting the synagogue, a Pittsburgh police officer engaged with him. 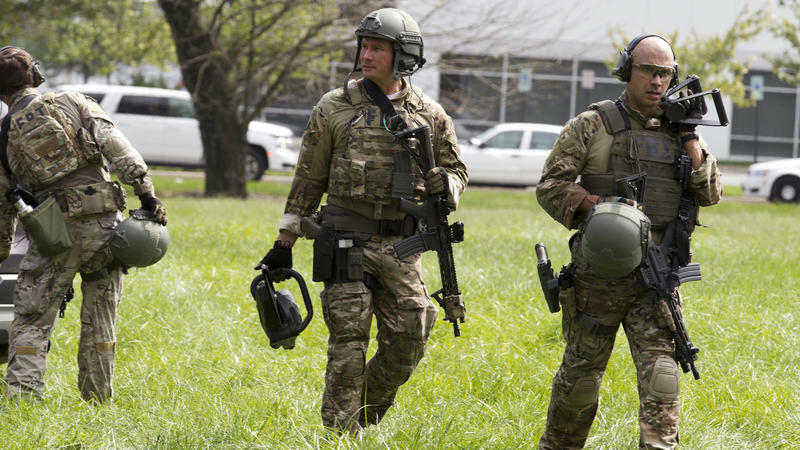 The officer was subsequently wounded, and as he withdrew, the suspect went back into the synagogue in order to hide from a SWAT team that was moving toward the scene, according to officials. Pittsburgh Police Chief Scott Schubert praised the bravery of the officers who arrived on the scene. "Watching those officers run into the danger to remove people and get them to safety was unbelievable," Schubert said. An FBI agent stands behind a police cordon outside the Tree of Life Synagogue after a shooting there left 11 people dead in the Squirrel Hill neighborhood. On his way to Air Force One on Saturday afternoon, President Trump addressed the shooting, remarking that if there were an armed guard inside the temple, the shooter might have been stopped. He also suggested that bringing "the death penalty into vogue" would help deter such attacks. Speaking to reporters at Joint Base Andrews in Maryland, he said of the lack of an armed guard: "They didn't have any protection. They had a maniac walk in, and they didn't have any protection." He added: "And, that is just so sad to see. So sad to see. The results could have been much better." The president said the nation should "stiffen up laws in terms of the death penalty" in order to prevent such shootings from happening in the future. "I think they should very much bring the death penalty into vogue," Trump said. 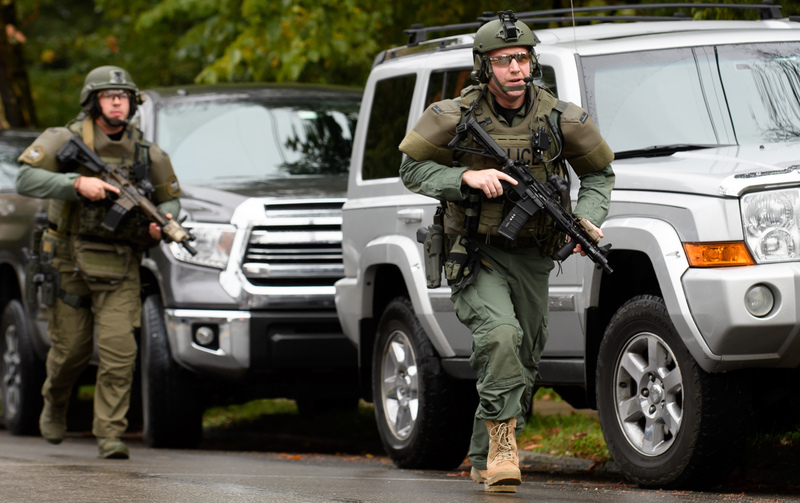 Police rapid response team members respond to the site of a mass shooting at the Tree of Life Synagogue in the Squirrel Hill neighborhood. "Anyone that does something like this to innocent people that are in temple or church, we've had so many incidents with churches ... They should really suffer the ultimate price, they should really pay the ultimate price. I've felt that way for a long time." Pennsylvania is one of 31 states where capital punishment remains legal, but it has been almost 20 years since the state has carried out an execution. In a statement, Attorney General Jeff Sessions called the shooting "reprehensible and utterly repugnant." Sessions said the Justice Department "will file hate crimes and other criminal charges against the defendant, including charges that could lead to the death penalty." Upon arriving at the Future Farmers of America Convention in Indianapolis, Trump again addressed the shooting in speech, saying it was "hard to believe" and "frankly something that is unimaginable." "This was an anti-Semitic act," Trump said. "You wouldn't think this would be possible in this day and age, but we just don't seem to learn from the past." Vice President Pence commended law enforcement officers for their swift response. "There is no place in America for violence or anti-Semitism and this evil must end," Pence said at an event in Las Vegas. 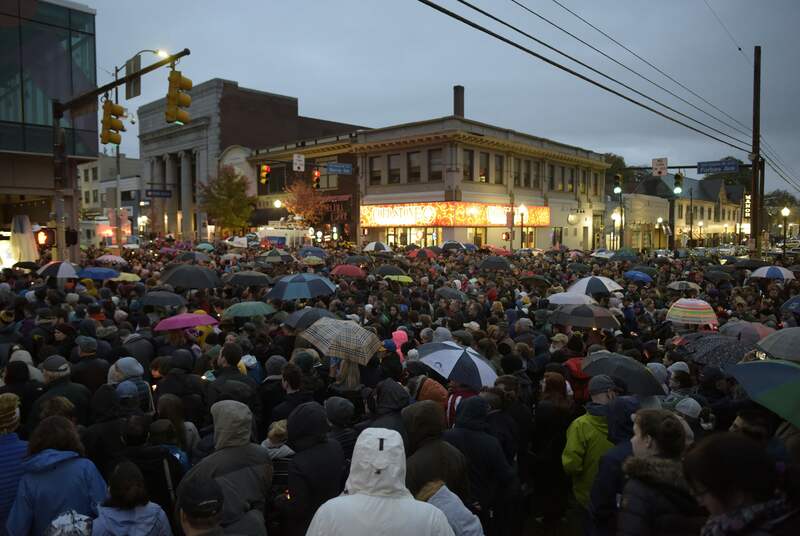 Members of the Squirrel Hill community come together for a student-organized candle vigil in rememberance of those who died earlier in the day during a shooting at the Tree of Life Synagogue in the Squirrel Hill neighborhood. He echoed Trump, agreeing that anyone who opens fire on worshippers should pay the ultimate price. Israeli Prime Minister Benjamin Netanyahu said in a video statement that he was "heartbroken and appalled" by the shooting. 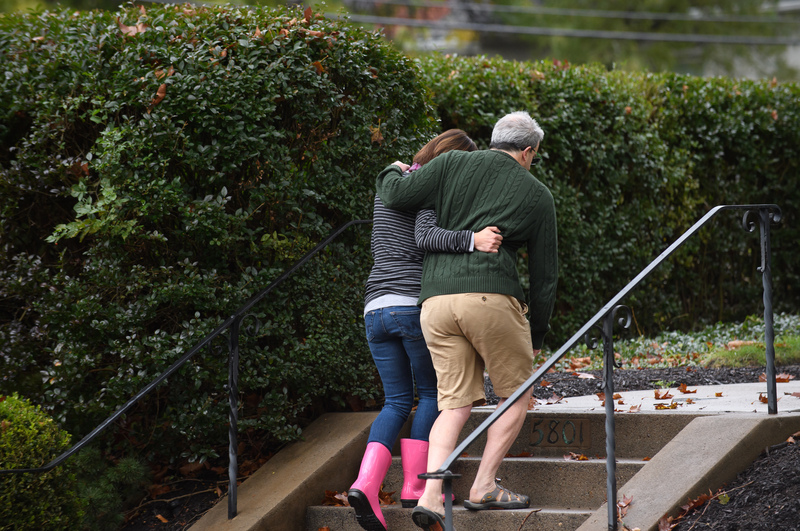 Neighbors around the corner from the site of a mass shooting at the Tree of Life Synagogue embrace one another. "Despite continuous calls for sensible gun control and mental health care, our elected leaders in Washington knew that it would fade away in time. Unless there is a dramatic turnaround in the mid-term elections, I fear that that the status quo will remain unchanged, and school shootings will resume. I shouldn't have to include in my daily morning prayers that God should watch over my wife and daughter, both teachers, and keep them safe. Where are our leaders?" Residents talk to the media near the site of a mass shooting at the Tree of Life Synagogue. Three people were killed in a workplace shooting Thursday morning in northeast Maryland. Several other people were wounded during the attack at a Rite Aid distribution center. The shooter, identified by the sheriff as Snochia Moseley, 26, of Baltimore County, also died; she shot herself in the head. Who Is David Katz, The Jacksonville Mass Shooter? Police have identified the suspected gunman in Sunday’s mass shooting in Jacksonville, Florida. 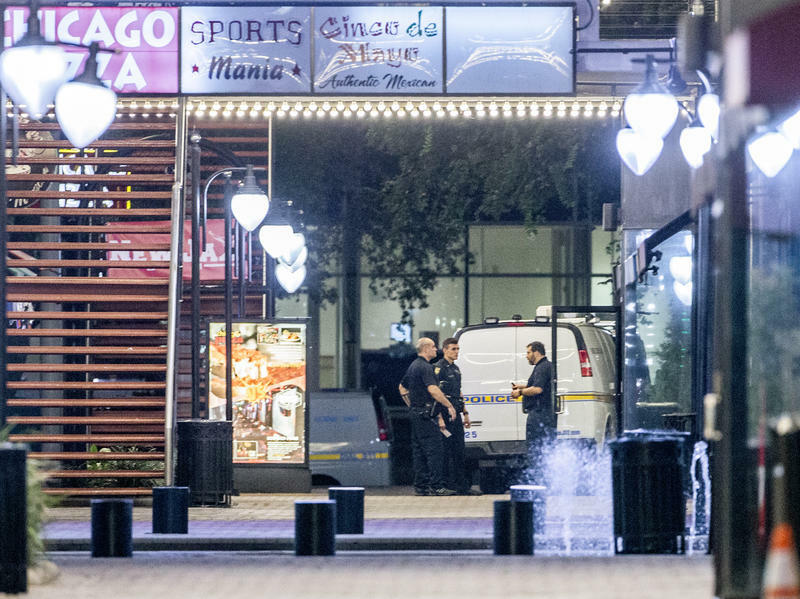 During an evening press conference, the Jacksonville Sheriff’s Office announced that 24-year-old David Katz is believed to have opened fire at a football video game tournament at The Landing in downtown Jacksonville. Officials said Katz turned the gun on himself after firing several bullets, killing at least two people and injuring more than a dozen others. Police said the death toll may climb.